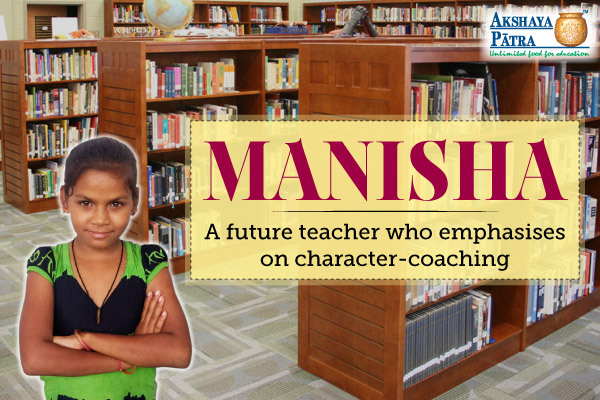 Home » Our Work » Stories of Children » Manisha wants to shape up children's life with great values! Namaste! My name is Manisha Devipujak. I am 12 years old and I study in Standard VII at Shri Ravishankar Maharaj Prathmik Shala – 166, Gujarat. I love my school very much because it has a room full of books called "Library." I want to read all the books in the library. It takes me to a fascinating world of knowledge where I get to know many new things. From the scientific mysteries to finest puzzles/crosswords or the valuable life-lessons through the lenses of ground-breaking historical personalities - life is better with books! I have three sisters and one younger brother. After the demise of our father and mother, we stay with our grandfather who is still in service. He is very supportive. When we miss our parents, he consoles us and makes us feel that it is sometimes ok to cry and release our emotions. Their blessings are always with us. Having faced the reality of lack of opportunity and resources, my grandfather believes that education is the only tool with which we can lead a thriving life. With this intention, he enrolled us in the school. I like reading and writing. I intend to be a teacher and inspire children to inculcate good values, morals, and build good character, which make life more valuable than knowledge itself. I am aware of Akshaya Patra as it serves tasty school lunches in my school every day. Khichadi, sabji, and thepla makes my favourite mid-day meal at school.